In 1968, the Bureau of Freshwater Fisheries initiated the process of identifying and classifying New Jersey waters according to their suitability to support trout. Five years later, a classification system for New Jersey waters was developed. The Bureau's classification system, although already in use by various programs within the Department, was formally recognized in 1981 under the State's newly adopted Surface Water Quality Standards (SWQS). High water quality and habitat standards necessary for the survival and successful reproduction of trout have made these fishes useful bio-indicators of stream health. 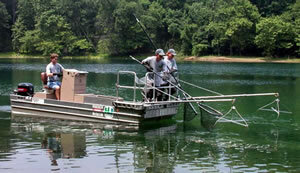 Today, waters of the state are classified according to their suitability to support trout. Lakes are classified based on their ability to support trout year round, whereas streams are classified on the occurrence of natural reproduction and the presence or absence of trout and/or trout associated species. Ultimately, the more suitable a waterway is to supporting trout the higher the classification and the more protection it will receive. The Department's Land Use Regulation Program, through Stream Encroachment, Freshwater Wetlands, and the more recently developed Storm Water Management rules acknowledge the fragile nature of these ecosystems and provide additional protective measures. During the summer months a 150-meter section of stream is electrofished (single-pass) using one or more backpack electrofishers or a generator positioned on land or in a barge, with 2-3 hand-held anodes. All fish are captured and enumerated by species (total length measurements are taken on all salmonids). Physicochemical parameters measured include water temperature, dissolved oxygen, pH, alkalinity, conductivity, specific conductance, and stream width, depth, and substrate type. The EPA Rapid Bioassessment Protocols are used to assess in-stream habitat and riparian conditions with regional modifications. 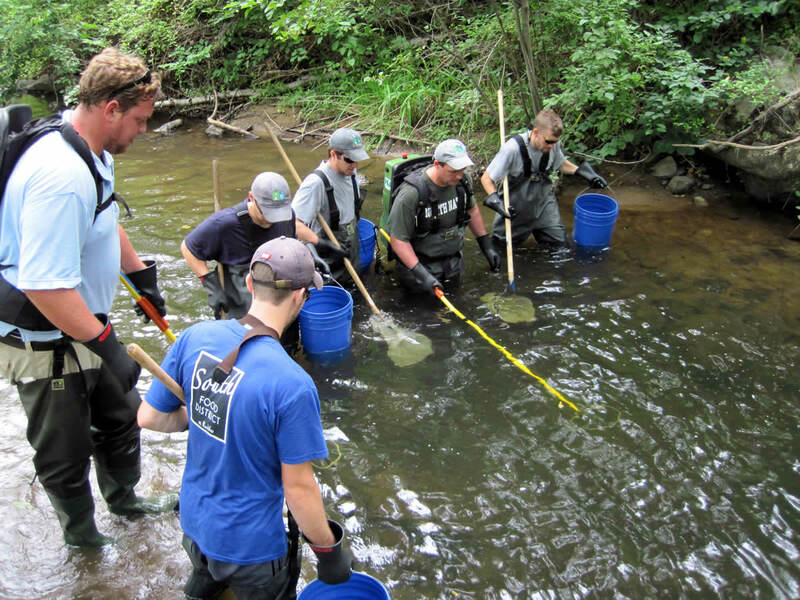 Although a vast amount of work has been accomplished in classifying New Jersey waters, waters continue to be classified and reclassified according to their trout supporting capabilities, when justified by additional field investigation data collected by the Bureau. The official surface water classification of waters is changed by the NJDEP Bureau of Freshwater and Biological Monitoring through an established rule making process. Every year, electrofishing surveys are conducted by the Bureau of Freshwater Fisheries strictly for classification purposes. Data obtained are used to not only support potential changes to individual surface water classifications in the SWQS, but also confirm existing classifications. 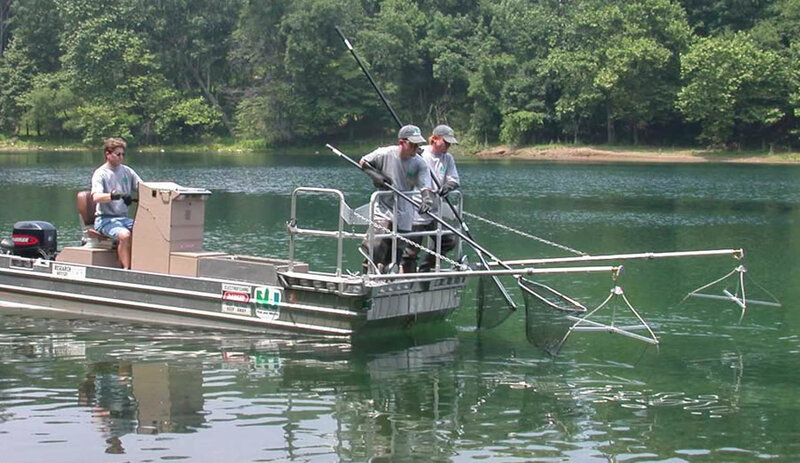 As part of the continued assessment of New Jersey waters dissolved oxygen/temperature profiles are performed to determine a lake's ability to support trout throughout the harsh summer months. During the summer most New Jersey lakes deeper than 3 m (10 ft) thermally stratify. The epilimnion (surface waters) become too warm to support coldwater fishes (trout), and the metalimnion and hypolimnion (middle and bottom waters), while often cold enough for trout, often have dissolved oxygen levels too low to support trout (and other fish species). Only deep lakes (generally at least 15 m (50 ft) deep), that are not overly eutrophic, maintain sufficient levels of dissolved oxygen in some portion of the strata below the epilimnion during the summer and early fall. A water temperature-dissolved oxygen profile is conducted in the deepest part of a lake using a YSI meter with cable marked in one-foot increments. Measurements are generally taken at 5 to 10 foot intervals, but more frequently (1-ft increments) when marked changes are observed (typically in the metalimnion). A secchi disk (also marked in one-foot increments) is used to measure water transparency. The criteria used to determine trout-supporting water is water temperature below 21ºC (69.8ºF) and dissolved oxygen greater than 4 mg/L.